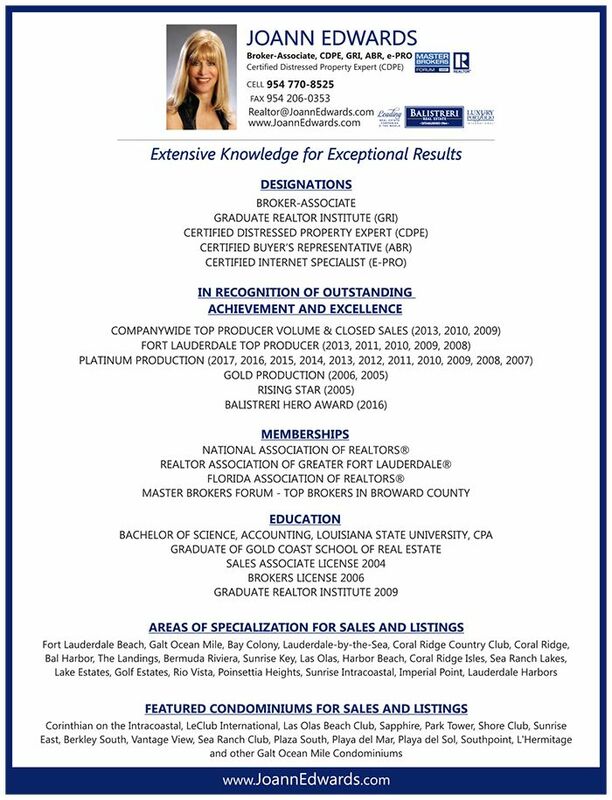 As Broker-Associate with Balistreri Realty and residential property owner living in the beautiful South Florida beach area since 1995, Fort Lauderdale realtor Joann Edwards has developed extensive knowledge of waterfront properties in the area. Her family Real Estate background combined with 15 years of public accounting experience as a CPA has given her the knowledge and tools to analyze and comprehend current market trends, creating added value when working with both buyers and sellers in any market. Her business has been built upon principles of Integrity and professionalism when dealing with clients and other real estate professionals. Her strongest assets are her extensive knowledge of the target market, her positive attitude and passion for real estate, and availability to accommodate the needs of each and every client. Her constant quest for knowledge and meticulous attention to detail keeps her on the cutting edge of the latest Internet technology for effective marketing exposure. Joann completed the requirements for her Broker's License in 2006, earned the prestigious Graduate Realtors Institute (GRI) designation in 2009, and her Certified Distressed Property Expert (CDPE) in 2010. She is a member in good standing of the elite Masters Brokers Forum, a group of the top Brokers in South Florida who have achieved the highest level of success in their field. She has earned the Platinum Achievement Award in each of the last 7 years and was the Companywide Million $$ Top Producer in Sales Volume and number of closed sales for Balistreri Realty last year.